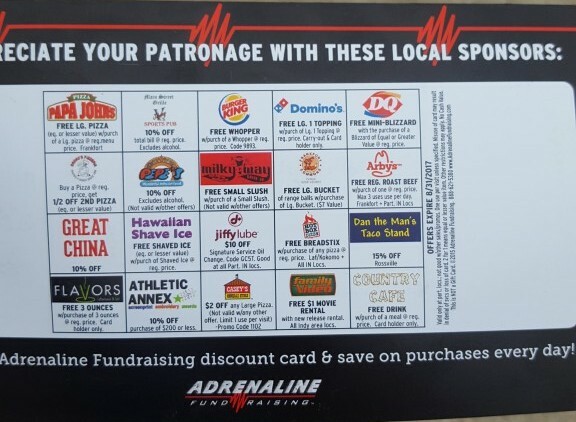 The Soccer Programs, Boy’s and Girl’s, are selling these discount cards for $20 per card good for various businesses in the area. Cities included are Frankfort, Lafayette, Kokomo, Rossville and some are even statewide. All sorts of discounts available: BOGOs, percentages off, and dollar amounts off purchase. 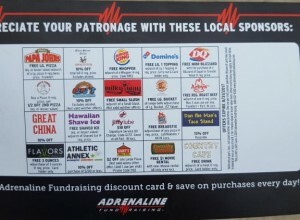 With these various discounts the card will pay for itself in 3-8 uses. What is even better they are good for an entire year. To get your card speak with a soccer player today. This is a contest between the two programs to raise the most money; so buy from your favorite player or coach!